I ama 5th generation farmer from the coastal plains of North Carolina. 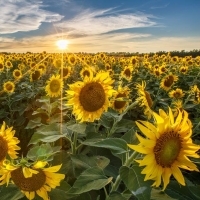 Our farm consists of corn, soybeans, peanuts, cotton, wheat and sunflowers. In 2016 I started Carolina Gold Oil Co. With low commodity prices we had to diversify. So we started the oil company to bring premium cold Pressed oils to your kitchen. We raise and press our own sunflowers and peanuts. After they are cold pressed we filter them down to one micron, to ensure a premium cold pressed oil the consumer is proud to feed their family. We no-till and cover crop every acre of farm ground. There no “GMO” sunflowers. So not to worry.